Nineteen years ago, Joy had her first encounter with nutritional balancing and hair tissue mineral analysis. When she first began the process, she had no idea where it would take her. Sick with an autoimmune disease that left her virtually crippled from the neck down, she had a two year old that she could not care for, and realized then that she did not want to spend her life ill. Within a few months of following this individualized nutritional balancing program, all her blood work normalized, and her vitality and health gradually became restored. She had tried many types of nutritional programs prior to this, but only nutritional balancing made a difference in her health. detoxification protocols, hair analysis and lifestyle modifications. clients inspiring them to succeed in gaining optimal health. This multi-level nutritional paradigm includes well-researched, informed professional recommendations that yield successful results. She has documented success in helping motivate her clients to achieve their best health. Joy is committed to assisting you in creating health and wellness in both mind and body. She feels quite honored to walk this path assisting you in your transformation to improved health and wellness. Joy's path has not been a straight one. In college, she envisioned herself passionately involved in the field of law and legislation as she believed that was how she could make a significant impact on a large group of people. Studying history at the undergraduate level and then graduate training in the area of public policy and education both at the University of Pennsylvania, Joy believed it was her route to making a difference in society. To further her training, she then went on to earn a Law Degree at the University of Miami and worked in the area of Corporate Law, focusing on Mergers and Acquisitions, SEC filings and Contract work. With a strong interest in the area of healthcare, she conducted legal research for a top tier medical institution working on health care related issues. She enjoyed her work, but it was not personally satisfying, so Joy sought out a different opportunity in the field of legislation and public policy. In her new role, she worked on writing legislation for a Fortune 500 Health Care Company, overseeing a successful house bill from start to finish, lobbying at the state capital, setting goals with legislators, and authoring legal documentation regarding auxiliary healthcare professionals. While she enjoyed the process of facilitating change in our society, she did not enjoy its political bent. Realizing that politics and law were not her callings, she pursued work in the area of education, volunteering in underprivileged cities, teaching children math, reading, and the importance of health and nutrition. As Joy began tutoring children in schools, she noticed that many children were undernourished and could not concentrate on their studies. She advocated for better nutrition and brought in a health expert to discuss food, health, and healing. Having learned from her experiences that nutrition was vitally important to her healing, and seeing how it was affecting children in schools, she began to consider health as her new path. Joy went back to school and began post-graduate training in Nutrition. It included pursuing a Masters Degree in Holistic Nutrition as well as one-on-one mentoring by Dr. Lawrence Wilson, considered one of the foremost authorities on nutrition and on the science of mineral balancing. Under Dr. Wilson's tutelage, she earned a certificate in Biochemical Nutritional Balancing Science from Westbrook University and also completed Advanced Training in Biochemical Nutritional Balancing Science. Joy is now an instructor/teacher of Nutritional Balancing Science where she educates new practitioners (e.g. physicians, chiropractors, acupuncturists and mid-level providers) on interpretation of hair charts, lends guidance on nutritional protocols, assists in teaching lifestyle changes, and explains how to recommend supplements based on interpretation of each individual's biochemistry. After beginning her private practice in nutritional balancing science, Joy was asked by some of her clients to put together a book, including the recipes for this program. Joyful Cooking, her first book has recently been updated and revised. Joy also has a children's book, Is Your Hair Made of Donuts?, teaching children "they are what they eat". To further assist her clients, Joy also studied Restorative Blissful Yoga, Yoga Therapy Training, Breath Work, and Meditation, as a means to provide additional healing techniques for clients on their path to transformation. Although Joy did not travel on a straight path, she did learn that life cannot be explained by perfectly linear predictability. It is mysterious, messy, muddied and yet, these experiences have inspired her to live life with truth, courage and grace. Currently residing in the Greater New Orleans area with her husband, Michael, an Orthopedic Surgeon, she has two lovely children and one funny Springer Spaniel. 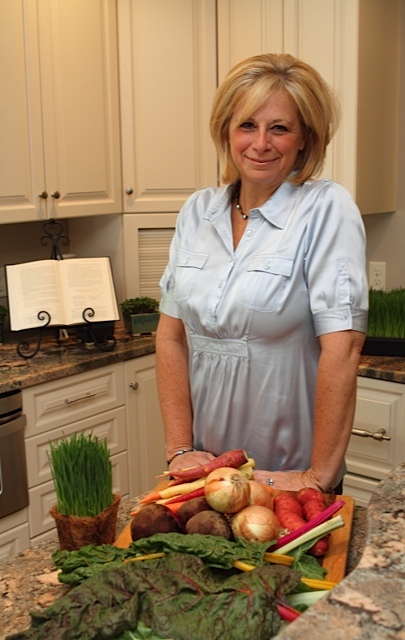 Listen to Joy's radio interviews where she discusses numerous aspects of Nutritional Balancing.